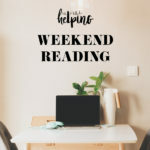 Toward the end of this past week, I found myself grappling with a couple of missteps—or errors, or mistakes, or whatever you’d like to call them. Small things, but substantial enough to make me feel regret. They were largely unintentional (and most of them were actually pretty impersonal, in the tune of missed deadlines), but at least two impacted other people, and I was sorry. I tried to handle the process of apologizing and moving on as gracefully as I could. One tendency I have, which I’d really like to modify, is that I tend to apologize excessively for errors. I know that it comes from a place of wanting to express my sorriness, but it also comes from a place of craving reassurance; I want to be told that it’s OK and that I’m OK. Sometimes I end up feeling that I’ve strong-armed another person into validating me. I’d like to approach mistakes differently so that I can avoid putting others in this position, which isn’t fair and is probably pretty uncomfortable. This wasn’t exactly the week, though. I did end apologizing too forcefully, all so that I could rid myself of the discomfort of regret. I have a feeling that recognizing and accounting for mistakes without clinging to remorse is going to fall under the category of “work in progress” for a while. Yesterday afternoon, I went to see Won’t You Be My Neighbor? I sensed that it would be good timing, and it was. The movie is incredibly tender, and if Mr. Rogers’ Neighborhood figured positively in your childhood—I was allowed little TV, but always that show—then you may find it as moving as I did. The movie is undoubtedly about Fred Rogers, and it paints a very glowing portrait, but what I like about the movie isn’t biography so much as a tribute to the idea that all people, children included, are valuable and special and lovable for who they are. Watching it encouraged me to do more of what I try to do already, but with plenty of moments of failing and forgetting: to pay attention to everyone, listen to what they have to say, and offer them my respect and lovingkindness. Mr. Rogers’ Neighborhood was a show in which puppets and “real life” adult characters acknowledged that people feel sad and scared a lot of the time. At one point in the film, Rogers says that he was trying to communicate the message that feelings are “mentionable and manageable.” This included feelings like anger, which kids—and to some extent, adults—aren’t always given freedom or permission to express. I read plenty about self-compassion and self-forgiveness, but being transported back to my own childhood and the time I spent watching Mr. Rogers’ Neighborhood reached me in a different way yesterday. It allowed me to acknowledge my okay-ness on my own, to look at the last few days of seemingly continuous blunders with a little humor, and to let it all go. I’m engaging more with the world and with other people than I have in a while. This means I get to savor connection and new experiences, but it also means that I’m sometimes going to say the “wrong” thing, put my foot in my mouth, do something that ends of hurting the feelings of another person. It’s time for me to let go of the fantasy that I can connect with other people in a way that’s exclusively pleasing to them and to me; instead, I can acknowledge the inevitability of conflict and commit to handling it as compassionately as I can. This isn’t the first time I’ve written about processing mistakes, and I’m sure it won’t be the last; as I said, this might be a lifetime project. But I’ll keep noticing and trying, and I’ll continue to feel grateful to those who are willing to let me communicate about it. Being willing to grow from mistakes, rather than being thwarted by them, is an inside job. But I think that part of the work is to hold space for others to struggle and make mistakes, too. We’re all in it together—a fact that I’m reminded of every single time I visit this particular space. I’m embracing you just as you are on this Sunday. 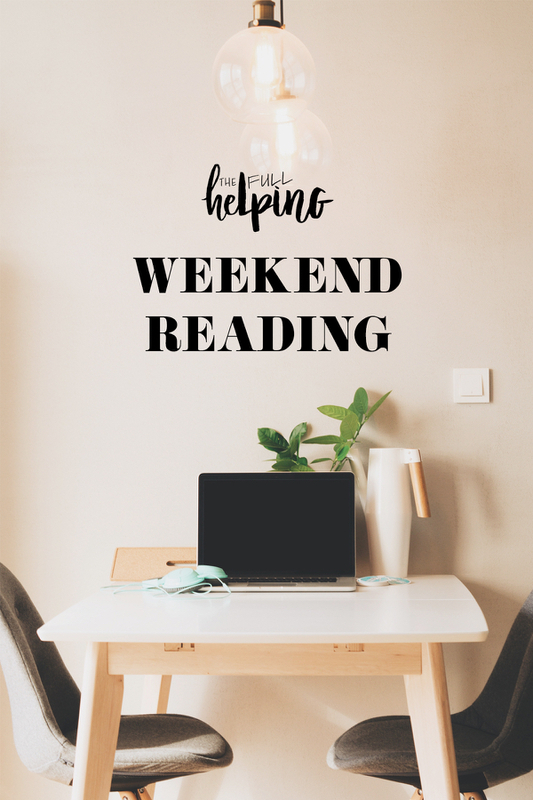 Here are the recipes and reads that caught my eye this week. 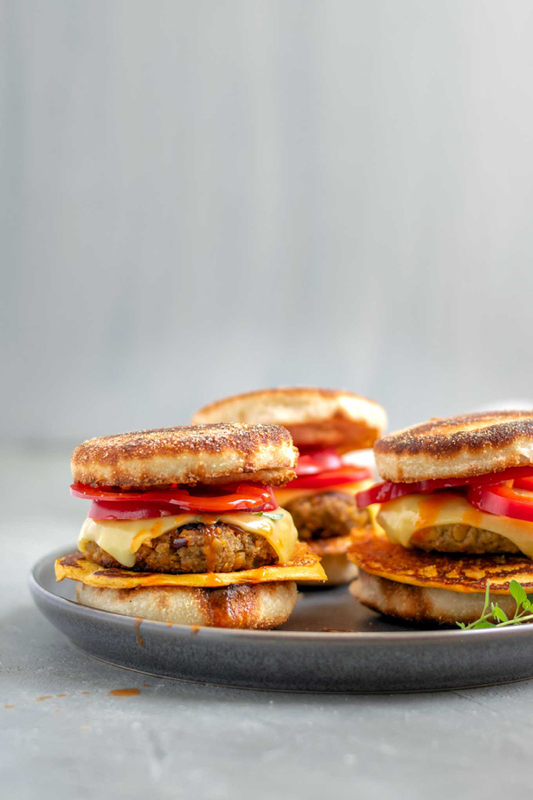 Eva has created the vegan breakfast egg and sausage muffin of my dreams. 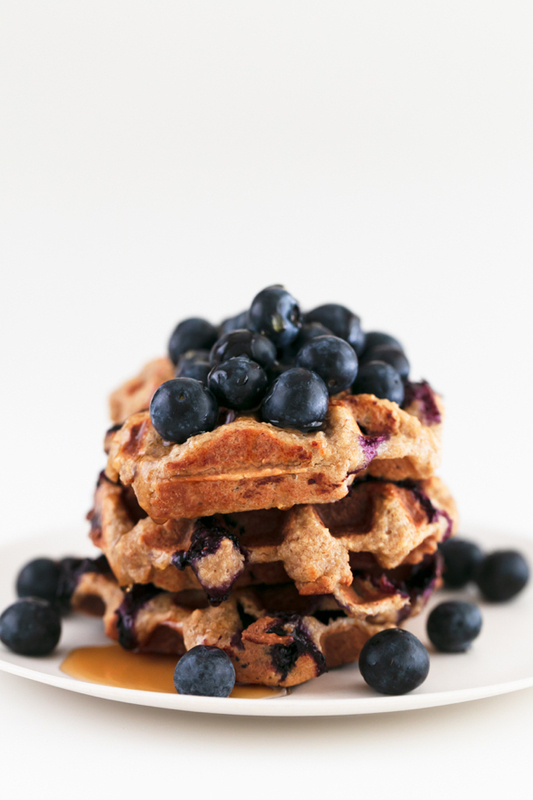 …and now here comes the sweet breakfast of my dreams: five ingredient vegan blueberry waffles. 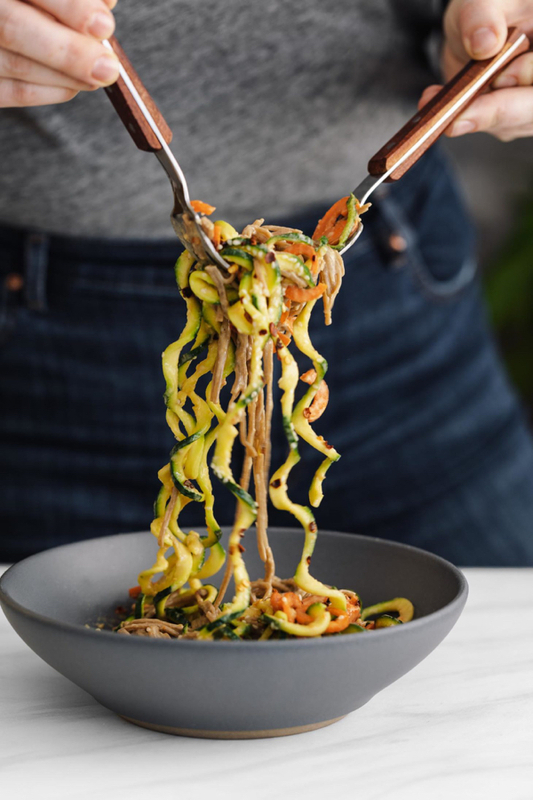 It took me a while to figure out that zoodles on their own didn’t cut it for me, but I love mixing them with spaghetti or soba noodles. Erin’s got the same idea with this summery zucchini soba bowl. 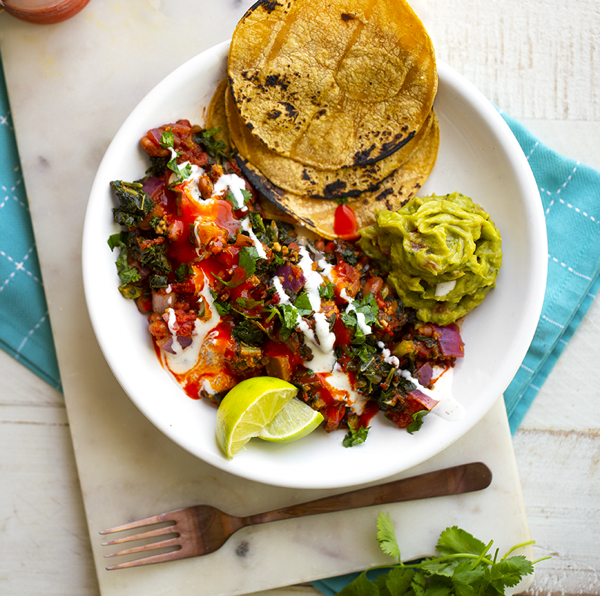 Drooling over Kathy’s speedy fiesta bean bowl—there’s nothing I love more than quick comfort food! 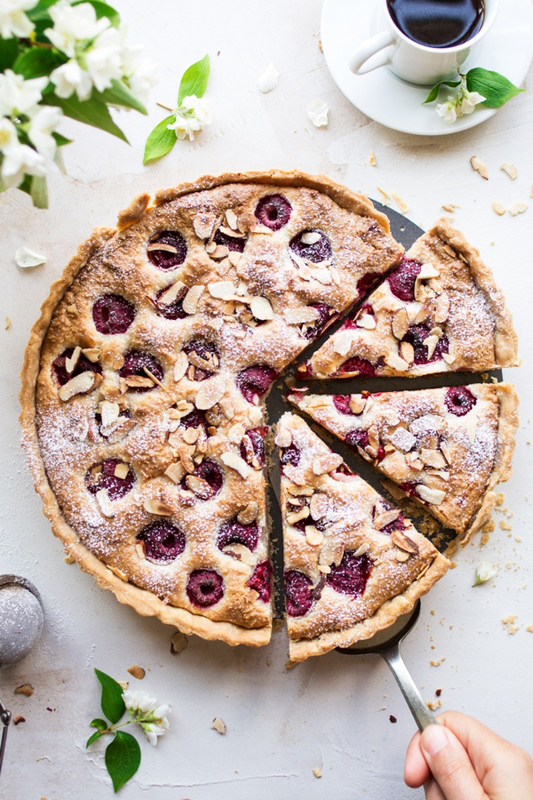 The first time I saw a raspberry bakewell tart, it was on The Great British Baking Show. I’m sure I’ve never tasted one, and I’m not sure I’m ready to attempt one, but if I ever do, I’ll use Ania’s fully veganized recipe. 1. We read so much these days about how vulnerable bee populations are, but this article made me marvel at how adaptive they are, too. 2. A compelling argument for why basic numeracy matters, especially in our technology saturated world. 3. A good look at nutrient pairings that are synergistic. I especially like the note about non-heme iron and Vitamin C (for more on plant-based iron, you can check out this post). 4. A lot of the elective research and papers I worked on while I was getting my masters involved the placebo/nocebo effect and especially its relationship with digestive illness. I was really interested to read about new research suggesting that similar circuitry may have an anti-tumor effect. You have to have a sense of humor. It’s your suit of armor. There’s humor again—an asset, a gift, and a suit of armor. On that note, friends, happy Sunday. I’ve got a creamy, summery pasta dish coming your way this week! Long ago in some article about how to excel in the workplace or somesuch silly thing i read this piece of advice that really stuck with me; to “own” any mistakes and admit to them outright, no excuses or apologies, just saying yeah that was my responsibility and I screwed that up- and then focus on how to learn from and move past that. So far it’s worked well for me and quite frankly i think my superiors have been pleasantly surprised by the frank truth and not shifting blame or over-apologizing. Then again, i certainly have been harsh on myself on how i should have could have would have avoided said mistake in the first place. I definitely sympathize with you on over apologizing. I like the affirmation of other people and knowing that I am still viewed highly by others which influences my interactions somewhat negatively sometimes. I have loved reading your reflections because it is very clear that you know yourself and are always striving to better yourself which is very admirable. “I’m engaging more with the world and with other people than I have in a while. This means I get to savor connection and new experiences, but it also means that I’m sometimes going to say the “wrong” thing, put my foot in my mouth, do something that ends of hurting the feelings of another person.” This is such an important reminder, especially as these missteps have the potential to evoke feelings of shame or guilt strong enough to cause one to shrink back inwards, returning either to the safety of the ED or other dissociative behaviors. You’re so right that as life grows in proportion to recovery, so does the possibility for failure or error, and we must confront again and again the reality of our own imperfection. Thank you for this lovely post, Gena. I read all of the articles but the interview with Sylvia Earle was the topper. It’s been my feeling for awhile now that much of the fate of our world hinges on our ability to consciously care; to deliberately decide to acknowledge and do differently. I think the quote about the fish having feelings is the perfect example of that. Something in a person’s mind has to “click over” and shift from believing that there is no impact, to believing that everything is an impact and then to how can we minimize or mitigate that or even eliminate it (as in the case of going vegan, I hope). I am an inveterate apologizer and an introvert so I get stuck in an “advance/retreat” cycle a lot. I hate impacting people negatively. I like what you said here very much though, that you want to “pay attention to everyone, listen to what they have to say, and offer them my respect and lovingkindness.” This is exactly how I would like to do things. I am making some of those breakfast patties this morning, the sooner the better! Thank you again for another wonderful weekend post. I really look forward to them. Thank you so much for the link to the Sylvia Earle interview. I felt similarly after seeing “Won’t you be my neighbor?” this week. Such a good reminder that we are all special just as we are. I never stop needing to hear that. Thank you for sharing.